On the last lecture of our course, Ira Multaharju came to tell us about the music and dance in the Brazilian society. 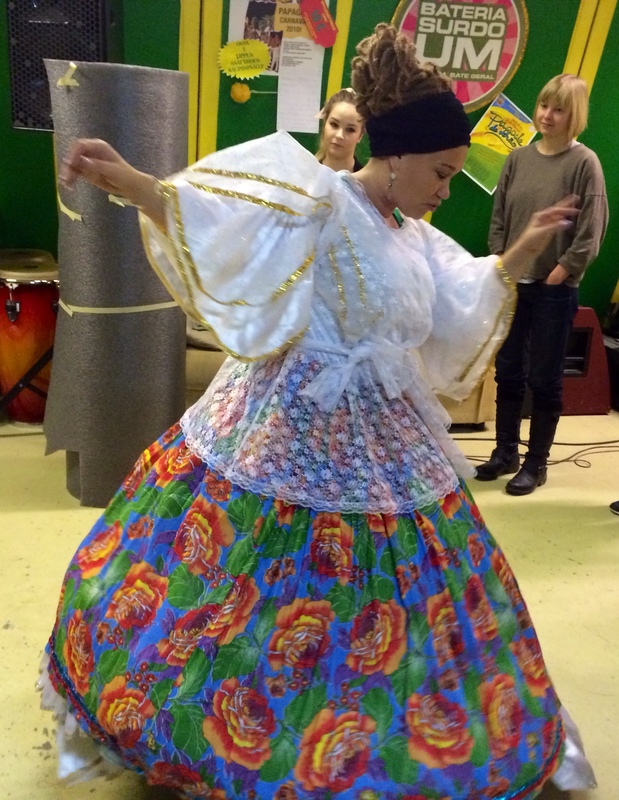 She has lived in Bahia in Brazil for more then ten years during the wintertime and she has been very active in promoting the Brazilian culture in Finland, especially through dance and music. The celebration of the carnival starts 40 days before the Easter, before starting the Lent. It has deep religious roots. The name Carnival has Latin origins carnem vale, which can be translated as ‘farewell to meat’ or ‘a farewell to the flesh’. The carnival period was free from the moral obligations and the religious rules. During the carnival time, people could disguise themselves as someone else. Originally, in Italy and in France, it was held among the highest levels of the society and women were not allowed to participate. In Brazil, the carnival was also originally a celebration of the higher social class, but in the 19th and 20th century the Afro-Descendants started to hold their own celebrations at the same time. Many samba schools were founded in Rio. The music with African background was prohibited in Brazil from 1814 until 1930, in Bahia even until the 1970. The African influenced dances and the body language were also regarded as culpable and godless. The first official samba procession was called Deixa falar which can be translated as ‘Let us speak’ and the first samba music was Pelo telefone. The samba grew very fast, very popular. The processions have well defined composition. There is a number of mandatory elements that need to be performed. Different components of the parade are called alas. The front commission, Comissão de frente, is the group of people that leads the whole Samba school and introduces it to the audience. They don’t necessarily perform samba dancing. Alegorias are the cars that have a big colorful structure over them and they carry people called the destaques ‘spotlights’. 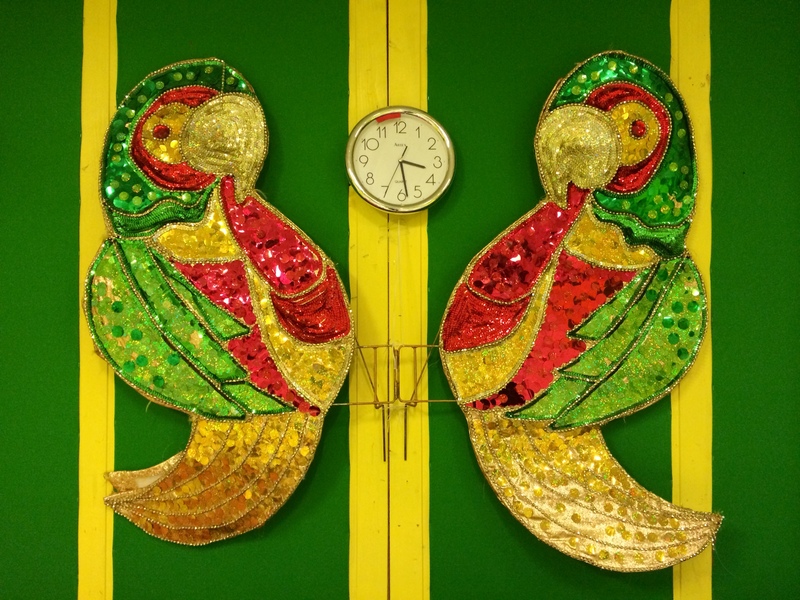 There are normally at least two of them and the first one carries the name and the symbol of the samba school. Mestre-Sala and Porta-Bandeira is the couple which dances in a graceful manner, the choreographic style is typically European, ballet-kind choreography. Porta-bandeira, the Flag-Bearer, is woman by definition and carries the flag of the samba school. She is the focus point of the procession and has extremely exuberant and luxurious carnival costume. Mestre-Sala is a figure which pairs with Porta-Bandeira. His main function is to protect the Porta-Bandeira and the banner of the samba school. That is why Mestre-Sala carries symbolically a handkerchief or fan. Baianas are the women originated from the region of Bahia. They have a very distinctive traditional costumes, which are associated with religious symbols. Baianas tell about the origins of the samba. The Baiana women’s choreography always involves spinning and for that, the skirts must be round shaped. The spinning symbolizes the shake between secural and spiritual worlds. White is always the base color of the dress. Generally Baianas are elder women, which are much respected in their community. They are the best dancers of the samba schools, which are very well selected. They perform their dancing in front of the bateria. They are the most colorful and recognisable part of the procession, a kind of “showgirl” type’s in little clothes, who form the usual stereotype of samba dancers. Bateria is the drum section, which consists of hundreds of people playing a variety of drums. They keep on the rhythm for the parade. The leader of this section is always the Rainha da Bateria, the Queen of the Drums, who is usually a famous Brazilian actress. Puxador, lead singer, sings the enredo, the theme of the parade. Puxador is always a man and is usually aided by a group of supporting singers. Children have also their important part in the procession. They have all the ingredients of the adults carnival. The songs are written by children, while the floats and costumes are also made by them but under the supervision of the adults. Samba schools are designed to complement formal education, by providing children from the favelas and slums training in design, costume making, carpentry, lighting, sound, music, dance and other shills practiced by the samba schools. In Finland there are seven different samba schools. The biggest ones are Império do Papagaio in Helsinki and Uniao de Roseira in Tampere. The oldest samba schools are Império do Papagaio and Samba Carioca in Turku. Every year the samba carnival is held in Helsinki in June, where the Finnish samba schools compete and perform. The requirements are the same as in Rio carnival which is very important for the Finnish samba schools. The idea is to promote the knowledge of the Brazilian culture in Finland. The activities of the samba schools are based on volunteering. 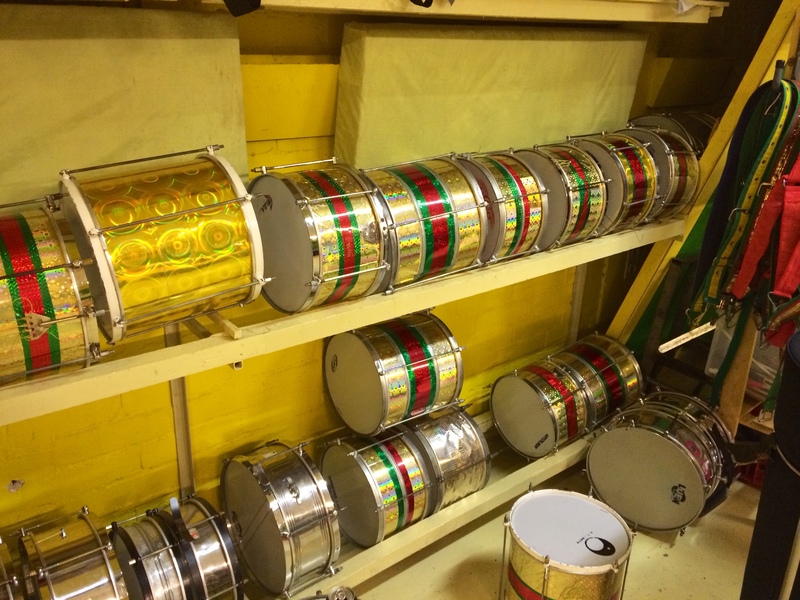 Samba de Roda – the “Original” Samba? Aino is working on her masters’ thesis on samba de roda in musicology at the University of Helsinki. Abroad samba is associated mainly with the samba carnival of Rio de Janeiro. In Brazil, samba is a much broader term. Aino is researching the samba de roda, the music and dance tradition of Recôncavo region in the state of Bahia. Samba de roda (“roda” means circle) is regarded the most traditional form of samba. It developed during the 17th century among the African slaves of Recôncavo. The evolution of the carnival samba in Rio de Janeiro is considered being a consequence of the migration of freed slaves in the end of the 19th century from Bahia to Rio de Janeiro. They brought with them the samba de roda to Rio, which then influenced the evolution of the urban samba. Samba de roda is a widely practiced tradition in Recôncavo.There are thousands of musicians and dancers. Almost all people in Bahia dance, Aino says, which is not the case in all of Brazil. Samba de roda is also associated with some festive days as well as Capoeira and with Candomblé ceremonies. There are different variations and styles of samba de roda, such as samba corrido and samba chula. Samba corrido is the informal, fast-paced dance (corrido means running). Samba chula is a delicate style, where the choreography and the structure of the music work together in a more complex way. In samba chula there are four male singers and players of pandeiro (tambourine), and a few viola (a small guitar with guitar strings) players. Other instruments can be atabaque, berimbau and chocalho. In chula, the dancers are generally female. The dancers and the singers are alternating, so when the singers sing, the dancers don’t dance, and vice versa. The viola player invites the dancers to dance with a certain way of playing, that “imitates” the dancers’ feet movements. The chula used to be a courtship dance, where young men and women meet. The dancer initiate the dance by dancing around the inside of the circle and “greeting” the players by dancing in front of each of them. The dancer inside invites the next dancer to enter the circle with the umbigada, the belly push. The songs can be improvised, so the singers have to listen to each other to catch up the song lyrics, which are then repeated twice. In these occasions, the playing is continuous, and one song follows another without any plan or pause in between. In Recôncavo, samba de roda has a very different context than the carnival samba of Rio. 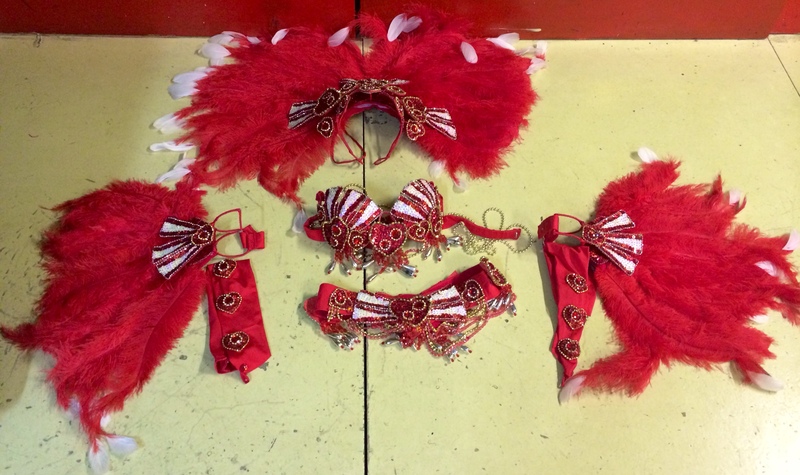 The carnival samba has been much more commodified, and is more about performance and appearance. Samba de roda has until now been a dance of the rural population, who dance after work.Aino witnessed many spontaneous samba rodas, which started even without intruments, just with the clapping of hands and singing. Then maybe someone brings in a water thin as a drum, while people form the circle. All present are invited to join. Only in the last years,there has been more staged concerts and festivals. In 2007, samba de roda was granted the status of Immaterial Heritage of Humanity by Unesco. The cultural ministry of Brazil started to direct financial support to Bahia for maintaining the samba de roda. This development is causing conflicts, too. Some perceive there is the danger that samba de roda is transforming too much into staged performances. The impact of media also plays a role. Nowadays, some of the performing artists take influences of the Rio carnival samba style. It is interesting that despite the huge popularity of samba in Bahia, they don’t play much samba in the radio, says Aino. In the radio, they play mainly music performed by non-blacks. This reflects the racism which Aino describes as a mechanism, that still today attempts to make invisible the Afro-Brazilian culture. The class and income differences still affect profoundly what cultural expressions are valued. The dysfunctional education system keeps the class divisions unchanged. Aino encountered the samba de roda in Bahia in 2009. She was in Salvador, and by a coincidence, she went with her friend to the town of Santoamaro. When leaving, they saw a mansion near the bus station, where they entered of curiosity. They asked some men at the gate what the place was. “The house of samba”, they answered. This was a revelation, since Aino had been fond of samba music she had heard, but had been never been interested in the Rio carnival. She later returned to stay for some time in the samba house of Santoamaro. She took music and singing lessons and participated in concerts. The house was run by the association ASSEBA, which has created a network of samba houses in the area. Aino visited musicians in different small towns in the area of Recôncavo, such as Sao Fransisco do Conce, Bom Jesus dos Pobres, Terranova, Conceicao do Josipe, Irara, Feira de Sant’Anna, Ilha de Itaparica among others.Her thesis is a musicological analysis. Even if samba de roda is performed in a spontaneous manner, it requires great skill.